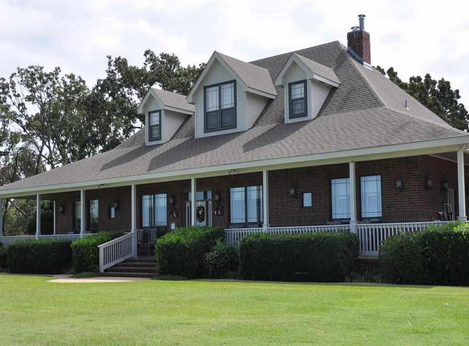 Who wouldn’t like to own this farm ranch for their single family in East Texas? Rooms and Internal Property Details – The property has 2 stories with 5 bedrooms and 5 bathrooms, hardwood timber flooring, vaulted ceilings, a gourmet kitchen, a beautiful fireplace and a room for formal dining. There is also a guesthouse, which consists of a loft bedroom and a workroom for ensuring that guests have a great time during their stay in the beautiful house. Kitchen – The kitchen consists of a range of equipment like double oven, microwave, disposal unit, dishwasher, refrigerator, pantry and indoor grill. There is also oven-gas/range that is free standing. Fireplace – The fireplace has a gas starter and allows wood burning to get a crackling fire. It is a beautiful brick fireplace. Dining Regions – There is a separate area for formal dining. In addition, there is a combined area that works as both a kitchen and a place for eating/dining. The breakfast bar is perfect for having breakfast with the family. Event Center – For all retreats, weddings and parties, there is an event center which not only has an apartment but also comes with its own commercial kitchen, bunk room, restrooms, storage loft, slab covered shed and a shed for equipment. Livestock Improvements – For livestock improvements on this glorious ranch, there is a stallion barn (20 x 40), a hay barn (42 x 58), working pens (60 x 60) and 2 loafing sheds that also have tack rooms. Cooling, Heating and Energy Efficiency – The house comes with central electric air conditioning with zoned three or more. The cooling is individually controlled in separate areas. The heating is central electric and zoned as well. There are also 16+ Seer Ac and the thermostat is programmable. The ranch consists of ceiling fans, and double pane windows and doors that are insulated. There are also turbines on the property. Security and Privacy – The house is a sturdy construction, made from brick and wood. There is security lighting on the outside and a barbwire fence surrounds the property. The entrance is gated for more security. There is an efficient security system that works 24×7. The ranch consists of skylight(s) as well. Apart from that, for internal safety and security, there are smoke alarms. Other Features and Amenities – There is also a porch, open patio and a pond. The television would get satellite access. There are 27 elementary schools, 13 middle schools and 12 high schools within 15 miles of the property. Lindale (elementary, middle and high) school is considered to be the best choice. 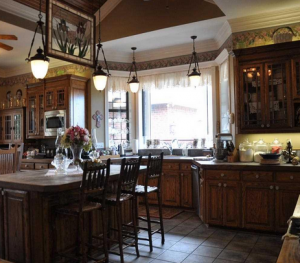 Spread over 4,770 square feet, this gorgeous ranch can be a dream come true for many people. It has every basic amenity, and the neighborhood is great as well. View property details for 22933 Cr 422, Lindale, TX 75771 and contact The Burks Team today!